Turned on the TV last night and caught an interview with one of my favourite footballers from back in the day. Leon Baker was not only a great player, but also an enigmatic character, which greatly added to his appeal. He arrived at the club in 1984 as a mature age recruit – 27 – and made an immediate impact as a skilful, precise and elusive centreman. He made All-Australian that year, but is better remembered for kicking the first goal of the last quarter in the grand final against Hawthorn, and the goal that put us ahead. He danced a little jig at that point knowing that we were on the way to victory. We kicked 9.6 in that quarter (a record till the following year, when we kicked 11.3) to come from 4 goals down to win by the same amount. It was one of the great premiership quarters. Baker was instrumental in that win, and was in our success the following year, when we dominated the competition. He was such a clean, clever footballer, and devastating on his day. To Essendon supporters of the day he’s a favourite because he was so good, and rated higher by us I think than by followers by other clubs. There’s always players like that, players that you know the value of watching every week that opposition supporters don’t appreciate. Baker is one of the best players I’ve seen at Essendon, which is a big statement because there have been some great one’s in my time. I reckon Baker would be in the top 10. The top 3 would be Hird, Madden and Tim Watson. The rest get mixed up after that, but there are some great names – Terry and Neale Daniher, Matthew Lloyd, Michael Long, Paul Van der Haar, Mercuri, Bomba Thompson, Jobe, Lucas, Salmon, Wanganeed, Misiti, and so on. Baker sits easily in their company. What makes him different is that he was not the run of the mill VFL/AFL character. He was a bit of a drifter, a shy, quiet type who went from one place to another seeking out experience before and since his footy career. He would fly out with his partner in the off-season to see the world with a back-pack on his back. As a footballer you’d describe him as a journeyman, but right off the top shelf. As an individual there was something bohemian about him. By all accounts he’s led a full life, and in my mind at least it adds to his lustre. He might be the best player you don’t know about – unless you were a Bomber supporter through the eighties. He only played 86 games, but they were all quality. It’s the footy off-season, committed footy-heads scour the newspapers for news of their club. They contribute to online forums, debate draft picks and the direction the club is taking, and some pop along to pre-season training. Being Melbourne there is always some footy news, but being summer it is also cricket season and so the other great Australian sport has the upper hand for the moment. I love my cricket, but like it or not I am also a footy head. Following a football team of any code anywhere in the world is all about hope. You dream you fantasise, you rant and rave and one day you may actually see your dreams come true. In a local AFL competition of 16 teams winning the top prize is a tough gig, but that never stops anyone from hankering after it. Whether in season or out of it to follow a footy team is all about the perpetual striving to improve even by the most minute of degrees, and everyone has an opinion. Like day following night, this is something that will never end. I’m more fortunate than most. Being a partisan supporter I like to claim my team – Essendon – is the greatest in the competition. In all reality and based on results alone there is some justification for that, with few to rival us and none with a better record. In that 16 team competition it’s nice to be winning ahead of the curve to keep you happy and give some spine to your hope – we average a flag about every 7 years. Pity the supporters of those clubs who have won no more than one or two over the journey, and who persist. The epitome of the footy fan I guess, though perhaps the triumph of indomitable hope over wretched experience. In my world greatness is not just about success. Sure, the raison d’être to compete in any sporting competition is to win, but it’s a bit sad when that is all there is. I dare say those supporters of the less successful clubs are sustained by a belief in the club and what it stands for as much as any hope of success. There’s a difference between winning well and winning badly after all, and inequities in opportunity that in many competitions tilt the table unfairly to the benefit of a few against the many, but to maintain the faith and to continue to strive regardless of odds brings out the best in us. I’m proud of my club in ways that go beyond the barnstorming success I have witnessed. I’m very privileged to have seen that, but I’m proud in another way. We’re a club feared by most opponents and hated by many fans, largely on the back of our success. That’s water off a ducks back. I’ve followed them all my life and been a close supporter for the last 30 years. I’ve been thrilled by the way we’ve played, and watched some superstars take the field in the red and black of Essendon’s colours. One of the greats was Tim Watson. He was a champion footballer who played over 300 games, played in three premierships and captained the club. He was foremost in a team of champion players, and a champion person on top of that. One of his claims to fame was that he was just about the youngest player to ever make a debut for an AFL club – just 15 when he took the field. Timmy Watson as he was known grew into a truly formidable footballer, 6’2” of dynamic muscle, too quick for anyone big enough to stop him, too strong for anyone quick enough to catch him. Back in the day he was my favourite footballer, and not just because he was so great. He became a good looking, charming man, intelligent and with a sharp, clever wit and the personal charisma you hope for from a club leader. He became a legend of the club and in some way another personification of it. I’m a great believer that while an organisation is made of the people who constitute it, the great organisations put their stamp on the people who represent it. Club culture is a term bandied around pretty widely, but it’s hard to dispute that it is real. Just this morning there are news reports of a couple of Carlton players getting in a brawl at Crown Casino, the latest in a long litany of misconduct by Carlton players. That’s a great club gone off the rails, a club culture that has gone sour because too much was let go by weak leadership. They have lost their way. That’s a risk any organisation faces, but I tend to think it is less likely at a club like Essendon. We’ve had flamboyant coaches and players, but the club as a whole has been progressively conservative. By that I mean we’ve been at the forefront of many advances – a pioneer with indigenous footballers, the first club to have a woman on the board, and generally going its own way, but quietly. You’d like to think as a footy team that there is a certain level of arrogance, and certainly our supporters are often described thus. Not the club though. Throughout my history of support the club has been prudently and confidently led, and let the results on the field speak for themselves. And so players come into this environment and become Essendon. 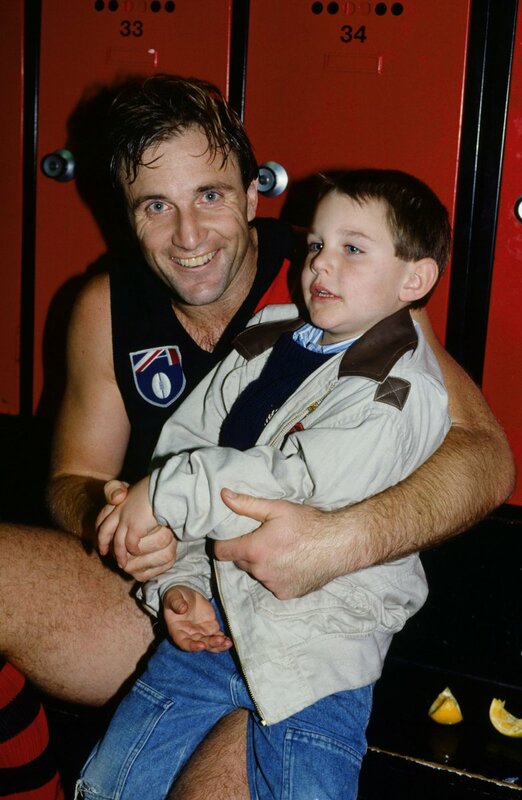 Our leaders have epitomised those qualities – brilliant, confident, intelligent and always humble: Watson, Thompson, O’Donnell, Hird, Lloyd – and now the son of Tim, Jobe Watson, as of yesterday. In many ways Jobe is very much like his father. He’s not nearly a dynamic a footballer as his dad, but he has the same down to earth decency about him. Since coming into the team in his father’s shadow he has quietly carved his own niche, and found his own game – that of the ball winner and distributor in the middle, the heartbeat of the team. Not for him the barnstorming runs and spectacular goals of his dad, rather he is the steady accumulator and shrewd disposer of the ball. He’ll win games for us, but unobtrusively almost. Like his dad Jobe speaks well with a natural humility and self-deprecating humour. You sense about him a real gentleness which is very manly. He is the type who commands respect in his person without demanding, or even expecting it. He is who he is. Clearly he is good people, come from a good family. It’s an appointment I applaud not just because he is a good player becoming great, but because he has the personal qualities I see representative of the club, and by his example I think he can inspire those coming into the club and take them top again – where we belong.